At Blooms Landcare, we specialize in creating beautiful and natural outdoor landscapes that enhance the setting of your home or workplace. While we believe that it is important to create an appealing outdoor space, we also value the impact our work has on the environment we live in. Because the materials and chemicals used in landscaping often pollute our world, we would like to suggest the following three green patio ideas for creating beautiful and eco-friendly landscape designs. Whether you are planting a large flower bed, or covering a plot of ground with wood chips or bark, preventing weeds is an important part of reducing the maintenance work and time needed to preserve your design. Instead of using a traditional plastic weed barrier to keep weeds from growing up through your landscape, one source suggests using a barrier of fabric instead. For a less permeate flower bed, laying a new fabric barrier each year causes less pollution, while helping to reduce your weeds. Keeping your plants healthy and bright often depends on the soil in which they are planted. One of the simplest green patio ideas we found is the implementation of organic mulch. Organic mulch helps to keep the nutrients in the soil while reducing toxins in the ground. Some of the most popular decorative barks and soils we use are organic and last for a long time. During the hot months of the year, maintaining a landscape may require a significant amount of water. Our Fort Worth yard care service can help to keep your plants well-watered while minimizing your water use and environmental impact using the right soil. With a well-drained soil base you can achieve greater water retention. 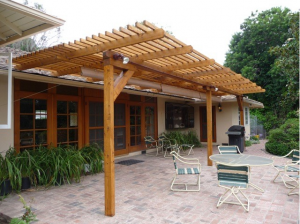 For more green patio ideas Contact or call Blooms Landcare at (817) 688-5352. Source: Independent Online “Getting water-wise while the heat is on,” March 13, 2014.